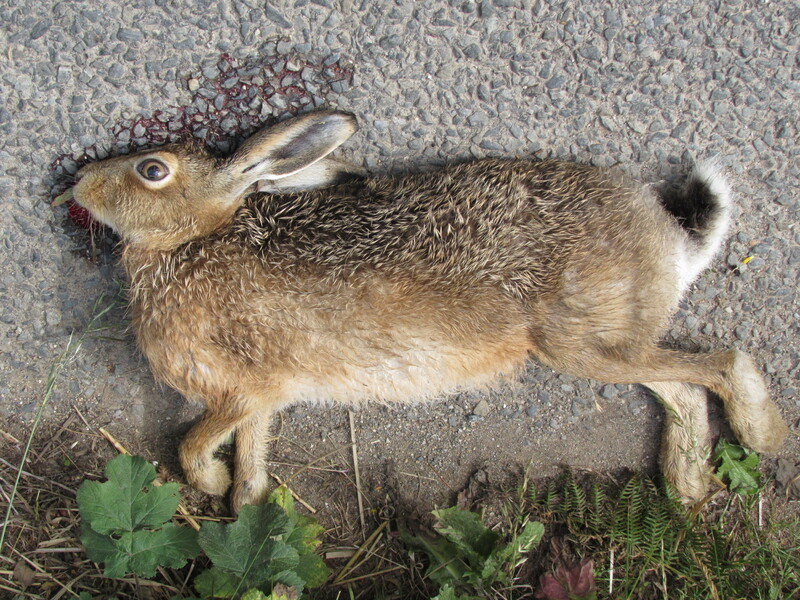 Sadly, a Hare I found this Summer on the road near our home. This print is called ‘Safe.’ It measures 300mm X 380mm. It shows a woman (wish it was me!) rescuing a Hare from lurchers. Hares live in the open, unlike rabbits who sensibly use burrows. So the Hare is always vulnerable and is in serious decline in the South of the UK, mainly a victim of changes in farming methods, road accidents and disease. 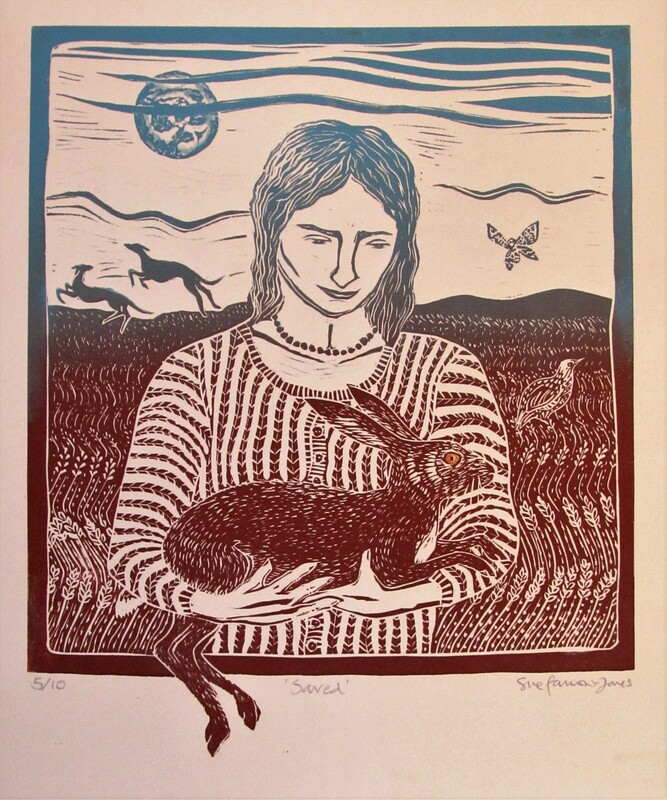 This print combines many of the images that have meaning for me – the Hare, a magical and much maligned beautiful animal, lurchers that have been our chosen dogs for about 25 years, (along with Irish Wolfhounds) and the moon, either full or crescent – they always seem to creep into a print or a painting of mine. Birds and moths are also favourite images and of course the countryside or coast as a background. I am a member of The Hare Trust, set up to protect Hares who suffer greatly at the hands of hunters. There is no closed season for the hunting of Hares as with other animals and birds subjected to hunting. This print is one of the first I’m submitting to an exhibition that is happening in September 6th – 18th of September this year. It is at Harbour House at Kingsbridge. Called Contemporary Passions, it is a shared exhibition, 10 of us are sharing the great gallery space there and displaying work that is our ‘passion’ at the present time, that is, contemporary for us. It was a lino print, and a graded colour print, a bit tricky as I don’t have a big enough roller to roll the ink on in one go so blending the colour had to take place on the plate using one roller in two separate actions without leaving a line. This image is on grey Somerset paper and I also printed the same image on Somerset white paper. It is an edition of 10 and there is also an edition of 6 using black ink on grey and white Somerset. I’m pleased with the print but aware it is a bit messy! I quite like seeing cut lines being printed, for me it is an essential part of a lino print, clearly not a painting. I now want to produce a print, the same size and colour, but showing the silhouette of the women in the background having released the hare; which will be in the foreground with it’s fore paws overhanging the frame – it might be called ‘Splitting Hares’ – it might not! This entry was posted in Uncategorized on January 6, 2016 by suefjsuefj.